Somehow I’ve managed to neglect my blog for 4 months. I’m currently on spring break, spending a week out in the country with my family–a perfect opportunity to catch up on here! I ended up getting a graduate assistantship (and I love my new job! ), so I’ve been working and attending grad school since January. This has made it a little more difficult to save money for and find time to train for races, but I’ve done 3 so far this year. 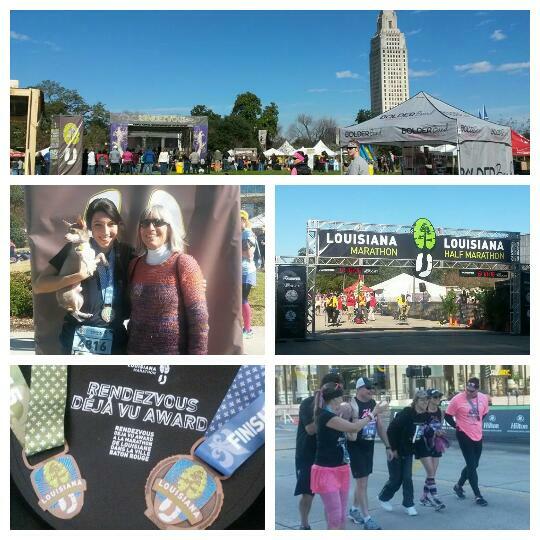 The 2nd weekend of January my mom and I raced in the Louisiana Marathon weekend. We got free registration for this event through my dad’s company, and the company’s donations went to the Rett’s Syndrome foundation–a great cause. That Saturday, I ran the 5K and my mom ran the 10K; on Sunday I ran the half marathon. Of all the runs and triathlons I’ve done, the Louisiana Marathon is by far my favorite. It’s well-organized, the route is lovely, it attracts people from all over the world, it’s competitive (but at the same time, it’s a race for people of all levels), it raises money for good causes, the food is wonderful, and the finish festival is a blast. As fun as the race is, my favorite part of this event is the Louisiana-themed Rendevous Finish Festival. Local restaurants and vendors set up booths with food, drinks, merchandise, and even physical therapy. Food and drinks were complementary with race registration; I had some amazing cheese grits, corn and crab bisque, stew, Core Power milk, and more goodies as post-race recovery. 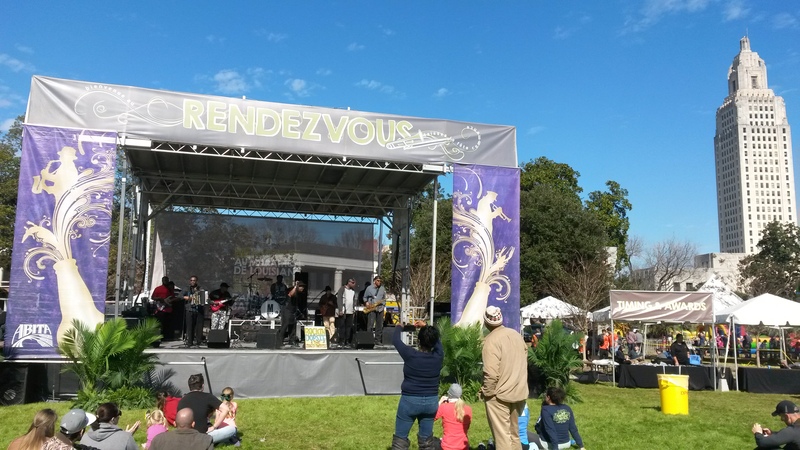 On Saturday, the entertainment for the Rendevous was Rockin’ Dopsie, a New Orleans jazz/blues artist. He played some original tunes and some fun covers. At one point his band played the Mardi Gras Mambo and Rockin’ Dopsie got off the stage to lead a line dance with the runners. Following him was Baton Rouge Music Studios, a group of super talented local high-schoolers. Rockin’ Dopsie was so impressed, he got on stage with them and offered them to open at his Live After Five show (might wanna check it out!). After the Louisiana Marathon, my boyfriend informed me one day that he had run over 2 miles in like 16 minutes. So of course I immediately got online and found a 5K for us to run together. 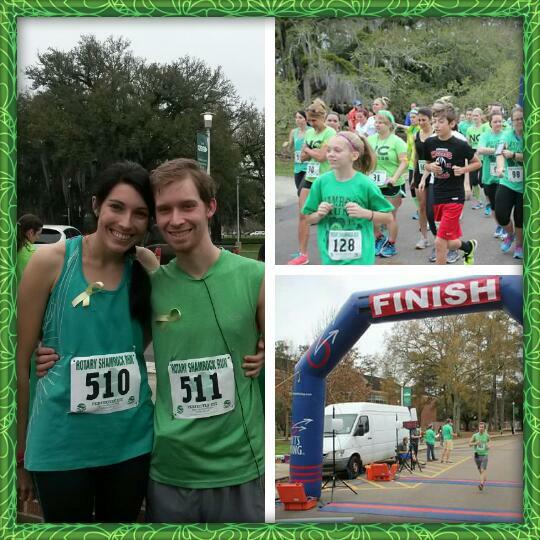 We only got in a few training runs before the Shamrock 5K on St. Patrick’s Day weekend, but we both did well. He actually beat me and was one of the top finishers! I think I have a new running buddy 😉 This race was small-ish (only 800 runners) but offered a 10K, 5K, and kids fun run. The route was around Southeastern’s campus, and the post-race party had some live music, good food, and a costume contest. This was much more fun and family-friendly than the St. Paddy’s parade, where many of my friends were spending that morning. The next weekend, I ran another fun 5K which raised money for a campus organization that supports the fight against human trafficking. This race, the Electrik Run, took place at night in a park on campus. It was a small race, and I ended up finishing 4th out of about 80 runners. This run was…interesting. It took place at night, and the park was not well-lit, so the main source of light–preventing my klutzy self from falling–was the glow sticks I adorned myself with (lol). It was a super fun race though!